These healthy food snacks are all raw and vegan. They are healthy and delicious snacks that will satisfy cravings while feeding your body with nutrition. Of course healthy food snacks include whole fruits, berries, vegetables, nuts and seeds - and these are great. 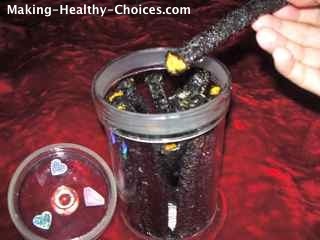 The recipes below will provide you with some ways to create different kinds of healthy snack foods that are great when at home and also when travelling, camping or out and about. Do you want to eat better but just don't know how to begin? Two of the biggest challenges people face when trying to eat better are habitual snacking on unhealthy junk food and not having something healthy and quick on hand when hungry. These healthy food snacks can help you with both of those challenges. Play with these recipes, find the ones you like and then use them. 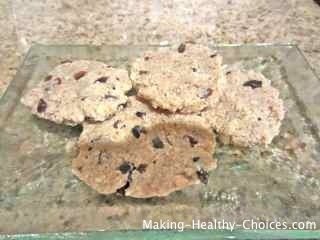 Make several of these healthy food snacks ahead of time and get into the habit of always having a stock of them prepared. With your cupboards full of these healthy food snacks you will always have something quick on hand when you are hungry and you won't have to reach for that unhealthy junk food. Plus you will be feeding your body highly nutritious foods which means cravings will lessen and your body will want for more healthy foods and will easily turn away from junk foods full of artificial ingredients. Just yesterday I had a beautiful conversation with a stranger. He was overweight but told me that he had been much heavier a year ago. He used to live on junk food and fast food. He told me that since he started eating more nutritious food and healthy snacks he is actually wanting more healthy food rather than the junk he used to crave. And he told me that he recently ate a fast food burger meal and he immediately felt sick and tired. He didn't want or crave having it again. By eating healthy your body will align with health - you will naturally (without even realizing it) turn towards healthy foods and not even want the unhealthy junk. 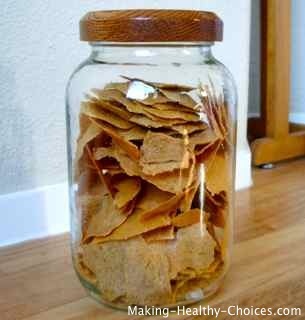 On this page you can find a resource for healthy snack recipes. Try the recipes, play with them and adapt them to your tastes so that you will love eating them. Click below to see the recipe for each item. Nori Wraps: These are great savory snacks perfect for every occasion. 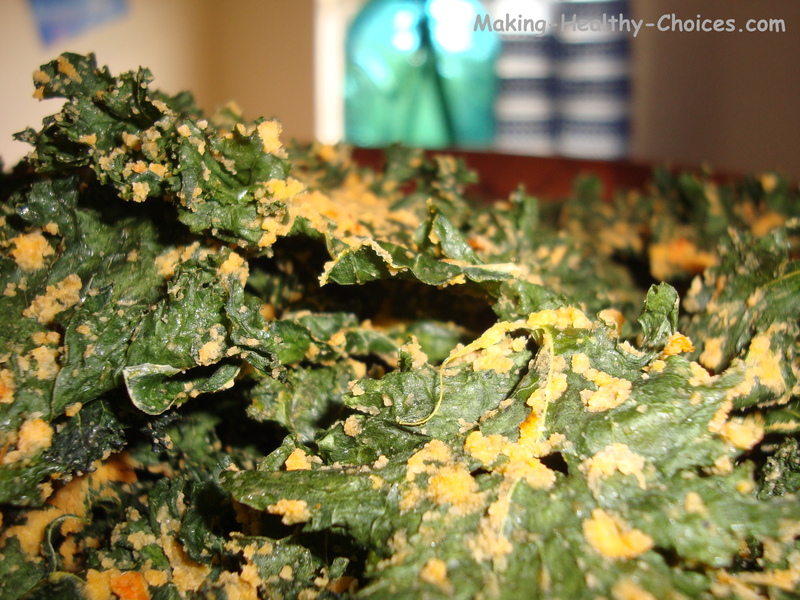 Kale Chips: Nacho cheese flavor, salt flavour, plain. 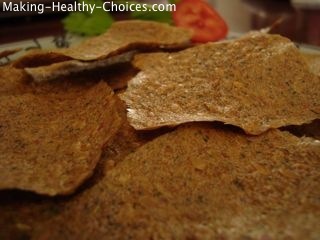 Great healthy substitute for potato chips. Coconut Jerky: A perfect little snack for when on the go or at home. Salty, sweet and spicy. Cauliflower Crunchies: The perfect crunchy and spicy snack. 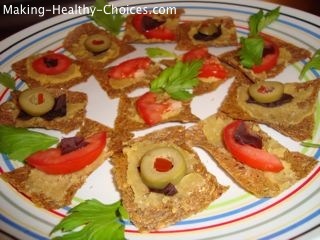 Eggplant Crunchies: Another perfect crunchy and spicy snack. Crackers: Because what is a snack cupboard without crackers? 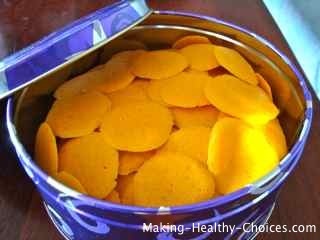 Cheez Wafers: Perfect on their own or on top of those crackers mentioned above. Cheez Dip: Great for dipping vegetables or crackers. 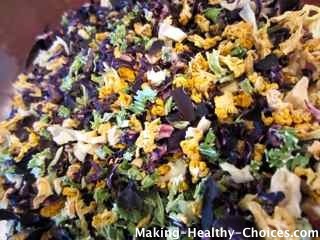 Dry Veggie Crunch Mix: These little morsels have so much flavour, makes a great trail mix of sorts. Cheezy Onion Rings: This unique snack may just hit the spot. Energy Bars - Raw Energy Balls: Perfect when on the go and for a quick pick-me-up. Lemon Bars with Lemon Coconut Frosting: A delightfully fresh and zesty snack. 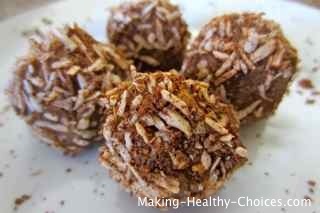 Lemon Bomb Energy Balls: These amazing little balls explode with lemon taste - they will blow you away! Chocolates: Because everyone likes something sweet and chocolaty sometimes. Chocolate Pudding: Sometimes nothing satisfies like a bowl of creamy chocolatey pudding. Cookies: Another one for when the sweet tooth is calling. Ice Cream: Who doesn't like ice cream? 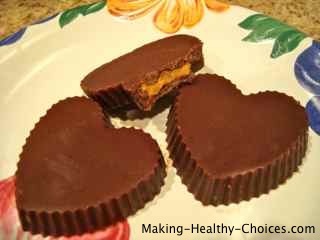 Create all of your healthy food snack recipes with LOVE - it is the secret ingredient that makes everything come together. Scroll down for more information on the ingredients listed. 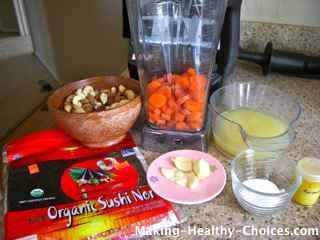 Mix everything except nori in the blender (I use a Vitamix Blender) and blend until slightly chunky. 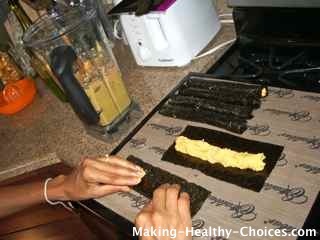 Use scissors to cut the nori sheets in half. 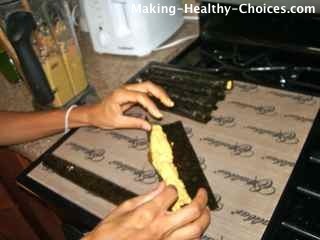 Spread a little of the mixture onto a nori sheet and roll into a cigar shape. Continue with rest of mixture. 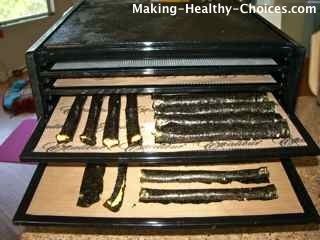 Place nori wraps on a dehydrator sheet (I use an Excalibur Dehydrator) and dehydrate until dry and chewy. Will take several hours. Try adding sun-dried tomatoes, chili powder or any other spices you like. Play with this recipe and make it into something you love. Carrots are a vegetable that many are already familiar with, they are widely available in most markets. Carrots are high in vitamin A and carotenoids. They also contain B vitamins, phosphorous, iodine and calcium to name a few. Carrots are wonderful in helping with constipation, indigestion, regulating blood sugar, purifying the blood, relieving menstrual pain, improving night vision, improving skin health and they are anti-carcinogenic. Select carrots that have a deep rich colour and that are firm and crunchy. Nuts and Seeds are high in protein and contain many vitamins and minerals. They are a good source of healthy oils, vitamin E and essential fatty acids. Many are great sources of calcium, phosphorus, magnesium and potassium. Brazil nuts are a great source of selenium. Lemons are a wonderful citrus fruit widely available in most markets. Lemons are high in vitamin C, B1 and potassium. Lemons aid in digestion, support the liver, improve absorption of minerals, cleanse the blood, break down mucous buildup, and they are antiseptic and antimicrobial, just to name a few of this fruits amazing properties. Garlic is widely used in many cultures. It has amazing benefits including tonifying the digestive and elimination systems of the body. Garlic stimulates metabolism and has been long used in many cultures to treat both chronic and acute diseases. Garlic is anti-bacterial, anti-carcinogenic, anti-fungal and works against parasites while at the same time promoting the growth of healthy intestinal flora. Garlic is found in most grocery stores and markets around the world. Turmeric has long been used in culinary and medicinal preparations. It is a very high source of beta carotene. It is a wonderful immune system booster that enhances digestion, dissolves gallstones, regulates blood sugar, is antibacterial and anti-carcinogenic just to name a few of its properties. Sea Salt is a much healthier option to iodized table salt. Sea salt is rich in minerals and the best ones to buy are the ones that are gray or pink. It can be purchased at most grocery stores. Vitamix Blender is a very powerful high speed blender that is fantastic for making healthy food snacks. To learn more about and/or to purchase the Vitamix Blender, click here. Excalibur Dehydrator with teflex sheets (needed for foods that start out as a thick liquid) is one of the best dehydrators out there. It allows you to dehydrate foods at a low temperature thereby keeping all enzymes and nutrients intact. This comes in really handy when making healthy food snacks. To learn more about and/or to purchase the Excalibur Dehydrator, click here.